We invite you to explore India - the Land with infinite beauty ! Whether you soar high into Himalayas or peer under the ruins of the Ancient monuments dotting the landscape of India, you will cherish the experience long after your visit ! This India Travel Guide on Tawang Arunachal Pradesh is free from any commercial interest! This site is dedicated to promote India - the vast subcontinent, its glorious past, magnificent landscape and its infinite variety. Famous for the 400 year old Tawang monastery, the place derives its name from Tawang Gompa. Tawang is located at a height of 10,000 feet in the eastern Himalayas of Arunachal Pradesh. The birth place of the 6th Dalai Lama, Tawang is famous not just as a spiritual abode but also for its pristine natural beauty. The entire hill town resembles a beautiful canvas, the mist rolling across the lakes, rivers and waterfalls. Brief History of Tawang: Tawang is sacred to Buddhists from the time of 1681 when the Tawang Monastery was established. Originally held by the Tibet until this place was redrawn by the McMahon Line and ceded to the British India. After India became independent the erstwhile North East Frontier Agency (NEFA) was reorganized and made into Arunachal Pradesh. China held this region briefly during the Indo-China War of 1962. China still continues to claim this territory as part of 'Southern Tibet' in a design to usurp the rest of North Eastern India - from Lhasa to Brahmaputra Valley. The best time to visit Tawang is between September and November; people who wish to experience clear weather and chill would love this season. Those who want to experience the snow capped mountains and landscape can visit Twang between December and March. Tawang Ganden Namgyal Lhatse: Literally meaning the celestial paradise, this is the spiritual centre for the Monpas and is also known as the Tawang monastery. It took over forty years for the construction to be completed. However the Chinese invasion damaged the entire structure in 1962. Reconstruction is happening in parts and is yet to be completed. Within the Tawang Monastery, you can find the monolithic gilded statue of Lord Buddha on a platform. The Dukhang or Assembly hall is an imposing structure. Its walls are rich with murals and the altar is home to Goddes Dri Devi, the main deity of this monastery. Turn the many prayers wheels located outside. In the Parkhang library, you can find valuable old scriptures, mainly Kanjur and Tanjur. Large collections like the Tangym, Sungbhum, old books and other manuscripts, both handwritten and printed, some in gold can be found here. Pankang Teng Tso Lake: There are numerous lakes in and around Tawang, the most popular among them being Pankang Teng Tso. Enjoy the natural beauty and calm at this spot. Regyaling Gonpa: Surrounded by lush green pine, this monastery is an enchanting beauty. Shonga-tser Lake: Also popular as the Madhuri Lake, this lake was formed after the earthquake of 1950. This lake is a photographer's paradise. Taktsang Gonpa: Also famous as the Tigers Den, this monastery is located on a hillock surrounded by dense coniferous forests. Tawang library: This library is a treasure trove for the Buddhists. The paper used to make these books is also produced locally from the bark of the Hong Seng tree. Sela Pass: Enroute Tawang is located the world's second highest pass at 14000 feet. Sela Pass has a high altitude lake of crystal blue water. 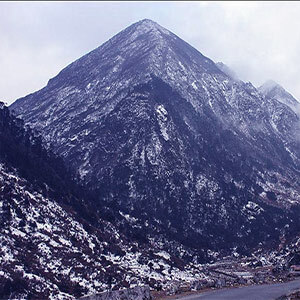 Sela Pass is often inaccessible due to heavy snowfall. The bluish waters of the lake reflecting the myriad hues of the sun are captivating. You can see hosts of rhododendrons alongside. Banga Jang Lake: Believed to be a pilgrimage spot, pilgrims who are truly devoted are said to see the various deities in the lake. Ghesila Range: This range acts like a protection wall for Tawang. Gorichen peak: It is a backpackers dream peak, but not too many manage to scale it. Bong Bong waterfall: The tantalizing water falling from the great heights is a pleasure to watch. Bap Teng Kang: Another beautiful waterfall that is worth a visit. Ani gonpas: There are numerous Ani Gonpas at Tawang, the popular ones being Singsor, Brahma-dung-chung, Gyangong, etc. Tawang war memorial: This memorial is built in the memory of the martyrs who laid their lives during the Indo-China war in 1962. Jaswant ghar: Home to the valiant warrior, Jaswant Singh. He fought continuously for 72 hours in the Indo-China war and laid his life for the country. Tawang is well connected by road however has limited connections by air and rail. Visitors visiting Tawang must take a permit from the Authorities of Arunachal Pradesh. Tourists can stay in the government owned circuit houses. Tawang town is about 16 hours from Guwahati. It is the nearest railhead. The nearest airport is Tezpur in Assam, which is connected to Kolkata. You have to take a permit to visit Arunachal Pradesh. Ideally, you can visit Tawang during July to October. You can pick up the local brightly colored skirts, beautiful shawls and bags, Buddha statues and Buddhist prayer wheels. Try out Tibetan dishes like Thupka, momos and other Monpa cuisine like Zan, Khura and Gyapa Khazi. You can plan your visit to Tawang during the local festivals. Losar is celebrated during February-March to usher in the Monpa New Year. Masked dances can be enjoyed, Khapse biscuits can be eaten and the natural surroundings can be savored.